Congress held a vote today on the rather mundane subject of renaming a post office, which normally passes with all 381 votes going for the renaming. That was not the case when a vote was held to rename a post office in Winston-Salem, N.C. after the world renowned poet and Presidential Medal of Freedom winner, Maya Angelou. The measure did pass with 371 votes, but its very telling that a party that claims not to be racist has nine white men voting no on naming a post office after a black woman. The nine Republicans who voted against naming the post office after Maya Angelou were GOP Reps Mo Brooks of Alabama, Ken Buck of Colorado, Michael Burgess of Texas, Jeff Duncan of South Carolina, Glenn Grothman of Wisconsin, Andy Harris of Maryland, Thomas Massie of Kentucky, Alex Mooney of West Virginia, and Steven Palazzo of Mississippi. Rep. Don Young of Alaska voted present. "Naming post offices is one of the most benign and bipartisan duties we perform in the House of Representatives, and there is rarely any opposition. 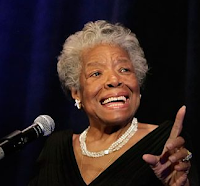 That's why I was shocked today as nine Republicans voted against naming a post office after Maya Angelou, indisputably one of our country's greatest poets, authors and civil rights activists. The fact that these nine Members would cast a no vote shows a blatant disrespect and only adds to the damaging actions they've taken this year to reverse progress from long and hard fought civil rights battles."